Victims say that officers in the borough of Tower Hamlets have ignored or downplayed outbreaks of hate crime, and suppressed evidence implicating Muslims in them, because they fear being accused of racism. The claims come as four Tower Hamlets Muslims were jailed for at least 19 years for attacking a local white teacher who gave religious studies lessons to Muslim girls. I enjoyed reading this open research article. The 13th century BC witnessed the zenith of the Aegean and Eastern Mediterranean civilizations which declined at the end of the Bronze Age, ~3200 years ago. Weakening of this ancient flourishing Mediterranean world shifted the political and economic centres of gravity away from the Levant towards Classical Greece and Rome, and led, in the long term, to the emergence of the modern western civilizations. Textual evidence from cuneiform tablets and Egyptian reliefs from the New Kingdom relate that seafaring tribes, the Sea Peoples, were the final catalyst that put the fall of cities and states in motion. However, the lack of a stratified radiocarbon-based archaeology for the Sea People event has led to a floating historical chronology derived from a variety of sources spanning dispersed areas. Here, we report a stratified radiocarbon-based archaeology with anchor points in ancient epigraphic-literary sources, Hittite-Levantine-Egyptian kings and astronomical observations to precisely date the Sea People event. By confronting historical and science-based archaeology, we establish an absolute age range of 1192–1190 BC for terminal destructions and cultural collapse in the northern Levant. This radiocarbon-based archaeology has far-reaching implications for the wider Mediterranean, where an elaborate network of international relations and commercial activities are intertwined with the history of civilizations. 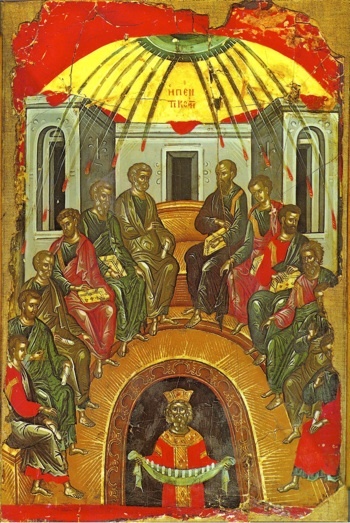 A feast of the universal Church which commemorates the Descent of the Holy Ghost upon the Apostles, fifty days after the Resurrection of Christ, on the ancient Jewish festival called the “feast of weeks” or Pentecost (Exodus 34:22; Deuteronomy 16:10). Whitsunday is so called from the white garments which were worn by those who were baptised during the vigil; Pentecost (“Pfingsten” in German), is the Greek for “the fiftieth” (day after Easter).